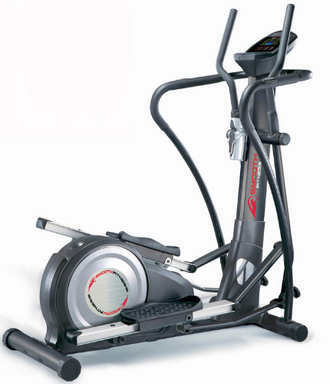 The Smooth CE 3.0DS is an innovative new elliptical trainer from a company with an excellent reputation. For starters, the Smooth CE 3.0DS combines a 21 inch stride length, which is about as long as you will find in your gym and ideal for even tall users, with a very compact foot print of 57 inches long and 27 inches wide. The Smooth CE 3.0DS elliptical trainer also easily converts to a stepper, giving you 2 different types of trainers and training routines for the price of one. Upper body handlebars provide for a full body workout. Maximum user weight is 300 lbs. The large, colorful display on the Smooth CE 3.0DS elliptical trainer provides all necessary data and controls 16 different programs and 16 resistance levels. In addition to the mandatory contact grips for monitoring pulse rate, a wireless HRM chest strap (included with the CE 3.0DS) also controls 4 different heart rate programs, where the resistance is automatically adjusted based on your heart rate. The Smooth CE 3.0DS also comes with a water bottle holder. As expected from Smooth, the warranty on the Smooth CE 3.0DS elliptical trainer is strong; Lifetime on the frame, 2 years on the braking system, parts, electronics and in-home labor. Free shipping and a 30 day guarantee is included when buying directly from Smooth. The CE 3.0DS is another quality trainer from Smooth and is both an elliptical trainer and a stepper, and at an attractive price.